We humans tend to live for the next day, next meal, car, job or vacation, growing up learning a craft, getting married and reproducing, loving our kids and paving their road ahead as well as possible without looking up. In 1959 we were “only” 3 billion people on the planet, and the experts believe we will pass the 8 billion mark sometime around 2024, as things look today. The challenge is that our sheer number, and our global and ever more craving lifestyle and culture, we are demanding cars, smartphones, roads, cities, resorts and timber faster than the planet can provide it. We are draining every resource, every place, as much as we can, for profit, for survival or just because someone above us told us to do so. When we look at the global population approaching 8 billion of us, it is amazing, so many stories, so many lives, so many feelings and so many destinies. We live longer, stronger and more connected lives every day. Check out worldometers.info for a updated live picture of the state of the life on Earth. A few countries have tried hard to change the course of destiny and alter the curve from heading vertical into an unstoppable crash. Most famous are China with its one child policy. Being one of the countries in the world with the largest population, this has made quite a splash… especially in a cultural dimension. But very few other countries than China are able to control their population growth. Take most of Africa, here the understanding of what it means to be a human, ones responsibility, relationships, power-structure and the whole culture is very very far from how the Central Committee of China can put the amount of children people can get into law with a simple central decision. In the way we live today we are fast reaching the end of our current lifestyle with cars, eating meat, buying more and more. But like zipping sugar-water out of a glass through a straw we do not experience the challenges gradually, but only when our own personal or national straw is not long enough any more. Today we globally produce more goods and food in a day to feed the world, than the whole world did in a year, just a few centuries ago, and nobody want to slow down the production-lines, instead we are all competing on expanding, up-scaling, refining and accomplishing and producing more and more in less and less time. Every day the rising amount of people on the planet creates a new gigantic amount of waste. Things that can no longer be used by us and we dump instead, first into the nearest waste-bin, and then either into the oceans or into huge landfills, or burn and release into the atmosphere as destructive chemical gases. Every second the world population now throw out an unbelievable unsorted mix of synthetic plastic, paint, left-over pesticides, chemicals, life-destroying quicksilver batteries and other poisonous metals and non-fixable electronic devices. On top of it we adds gene-modified substances, outdated foods of all kinds, and medicine drugs, clothing, cars, nuclear cooling water – And to that we continually add human waste, and industrial farming waste. Mixing it all together to a very destructive cocktail, we up til now has been confident that Earth will keep swallowing for us every day, without it having any influence on our population growth. Finding new and ever more space for an ever more and larger world population is getting harder and harder. There is simply not much space left on the planet that is not either being used to produce or transport industrial food and goods around ( farmland, mines, industrial forests, industry-reserved areas, harbors, roads, warehouses, malls and other infrastructure ) Neither are there much room left to build new places for dwelling (shanty towns, slum, high-rise, urban sprawl, towns, cities, resorts etc. Finding solutions that can make more people in the world thrive is also challenged by the way we structure and organize our global money-based culture. The whole foundation of the global world population rest more and more on the economic transaction and value structure of what is called the global market. Life today in the huge cities and the busy production areas are more stressful than ever, more and more people take medicine to deal with the challenges of modern life and more and more of both us and the animals we live from are stuffed with antibiotics and other kinds of drugs to keep us all going. But this gigantic use of medicine has made more and more bacteria, viruses immune to our weapons against them. At the same time we are more connected than ever, moving ourselves, food and other products, and any possible future infections and unknown antibiotic-resistant diseases around at an incredible speed, So there is a real danger today of an globally reaching epidemic that moves too fast for us to stop it. The amount of days the world population can live on the food we have stored in case of emergency keep getting lover. So if the planet hits a tough year with lover food production than normal it can trick a whole row of events, destabilizing whole countries, setting the whole world on fire. Climate change can radically change how much land is available for us, where we can grow food and where we can run for shelter. Through history just small variants in the global temperature and weather has most likely played a huge role in making whole cultures and empires collapse, as the balance tipped away from being sustainable under a new climate. More and more countries on Earth have the firepower to drastically change the curve of the world population in less than an hour today. Not only the classic super powers, but also new upcoming nations and dictators more and more often get their hands on new and ever more destructive nuclear, biological and chemical weapons. 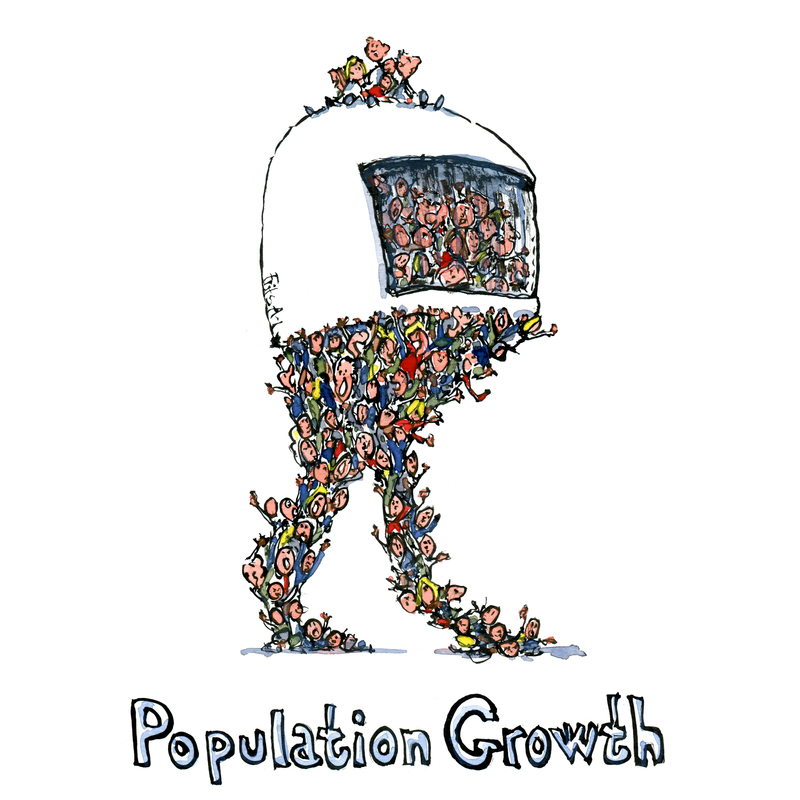 The solution to population growth that a lot of people pray for is that we somehow will be able to gradually slow down the global population growth by having fewer children. Unfortunately only a few countries are heading this way fast enough for it to make a huge difference as things look today. But there is one factor that has the power to change all this and that is if women at a global scale, gets much more to say, and men better at listening. Already with the world population alive on the planet today we have most likely passed the carrying capacity of the planet. (link: http://worldpopulationhistory.org/carrying-capacity/ ) But there are still sugar water in our straws and those in charge of the steering wheel still make great profit from the way things are today. The global population on the planet has often been compared to sailors in a small fragile ship, far out at sea. our little global ship keeps getting more and more crowded, but it is still floating and the sea is quite calm at the moment. The hard thing is to figure out how we can possible keep it floating, and head in the direction of a more sustainable place for all, before the weather change.